CAD Forum - Shared Views to your DWG drawings - easy collaboration with collegues and clients. 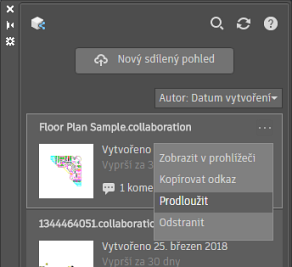 With the new function in AutoCAD 2019 - Shared Views (SHAREDVIEWS, the ribbon Collaborate > Share > Shared views) you can easily share your CAD design with your remote collegues and customers, without posting (and risking) your original DWG file. The above mentioned command opens the SHARED VIEWS palette a there you can click on "New Shared View" (or enter the SHAREVIEW command). In the dialog "Share View" you can then choose the share name and other sharing parameters. The function will generate a private cloud image of your drawing and creates a shortened unique web-link (URL) on "slovak" domain - e.g. https://autode.sk/2pDvqjr. This link is valid for 30 days (can be prolonged - see Extend) and you can hand it to your collaborators to display and review your drawing inside any web browser - the collaborator doesn't need any CAD nor any other software. Their reactions and comments will be displayed directly in your SHARED VIEWS palette as Comments. 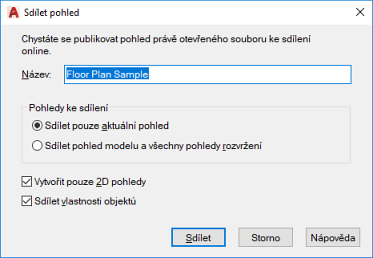 The web CAD viewer (localized in many languages) offers functions to enable/disable layers, switch views, measuring, printing and displaying properties of the individual selected drawing objects (if they were published). The comments are related to the respective zoom level (drawing detail). A similar function is available also in Inventor. Tip 11926: What is the Autodesk Screencast Group? Tip 11845: What is the difference between ShareDesignView (2017) and ShareView (2019) in AutoCAD? Tip 10370: How to record a screencast video from a CAD application? Tip 10317: How much slower is saving DWGs to A360 cloud? How to set output folder for AutoCAD plot to file? « | » Using the Pantone colors (palette) for your models in Fusion 360.